Injuries included cuts, back pain and complaints of general pain but were not considered critical, according to a UW spokesman. 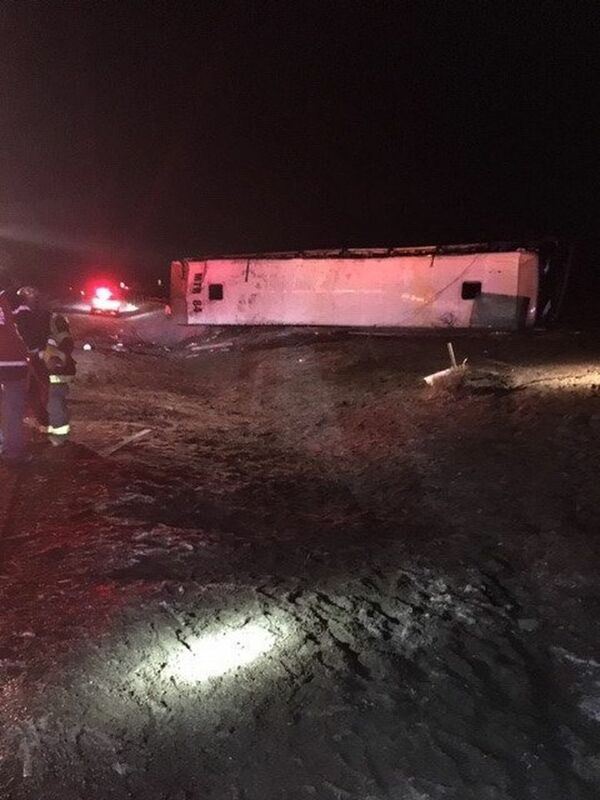 One of six charter buses carrying members of the University of Washington marching band and spirit squads to the Apple Cup in Pullman rolled onto its side Thursday on an icy stretch of Interstate 90, according to the State Patrol. Around 45 people were taken by ambulance to area hospitals to be treated for injuries that were not serious or life-threatening, according to Trooper John Bryant. Troopers, paramedics and deputies from the Grant County Sheriff’s Office responded. UW spokesman Victor Balta said the injuries included cuts, back pain and complaints of general pain but were not considered critical. “The university is doing everything it can to ensure the health and safety of our students and staff, and to get them safely back on their journey to Pullman,” Balta said in an email. The crash was reported at 5:26 p.m. on eastbound I-90 at mile post 146, about 3 miles west of George, according to Bryant. The charter bus Thursday night was not blocking the freeway, but was blocking a frontage road, he said. Bryant initially said there were three charter buses carrying band members, and up to 25 people were injured, but later amended that to six buses with at least 40 to 45 people sent to area hospitals. 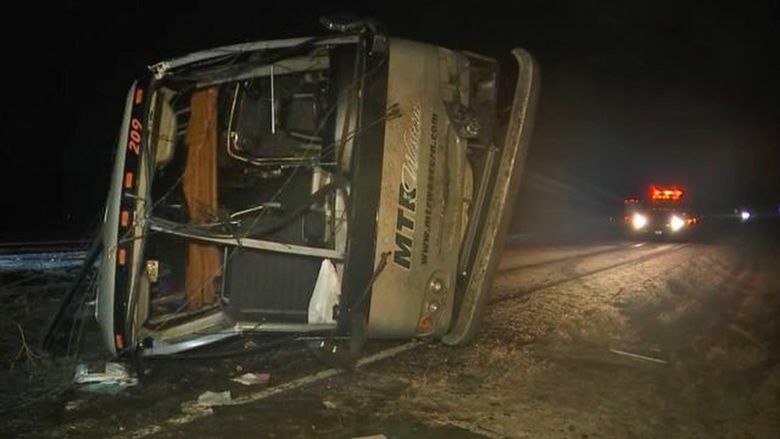 The bus that rolled was the third bus in the group, he said in a tweet. George is roughly halfway between Seattle and Pullman. Bryant said 56 people were on board the bus that rolled over. The remaining staff members and students boarded the other buses to George Elementary School, where they were assessed by medics, he said. The highly anticipated Apple Cup, the annual cross-state football game between the University of Washington and Washington State University, is set to kick off at 5:30 p.m. Friday.